Are wondering how to get more Pinterest followers? Are you looking to increase your Pinterest engagement and drive traffic? In this article, I’ll share 12 tips on how you can get more Pinterest followers and promote your business. More Pinterest followers can help you get more likes, repins, comments, clicks and impressions. The Pinterest buttons can help convert website visitors into followers. MindBodyGreen placed Pinterest buttons on the header and the sidebar of their website to divert website traffic to their Pinterest page and attract some of their thousands of followers. This should also help them attract followers who like reading their content, as they’ll be directed from the blog. 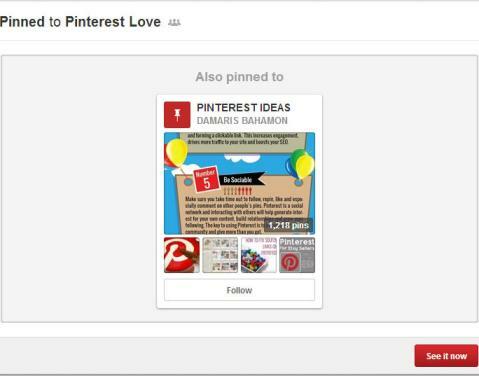 Similar to the Follow button, the profile widget also leads your website visitors to your Pinterest page. But you may find the profile widget more effective than the Follow button because it’s bigger and can display up to 30 of your latest pins. The profile widget can also help you attract followers from your website. Find out how to install a profile widget here: Pinterest Business Accounts: The Definitive Guide to Getting Started. Again, you can create your profile widget by using the widget builder or you cancreate a custom one as seen on Marie Mosley’s Pinterest page, Code it Pretty. On the left sidebar of the blog, you can see a profile widget which displays Code it Pretty’s latest pins. 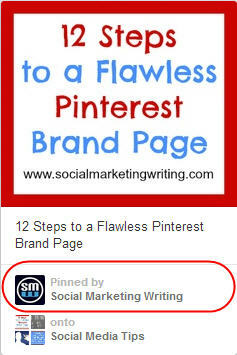 This should not only drive potential followers to your Pinterest page, but also to the pins displayed, as they’re clickable (and enlarge when you scroll over them). Sometimes after you pin an image, you see the option to follow a board on which the same pin has been added. You usually get the message “Also pinned to…”. After you pin an image, Pinterest suggests boards where people have pinned the same image to help you easily find people to follow. This is Pinterest trying to help you find people with similar tastes. When you find and pin a lot of images people enjoy, Pinterest will recommend you more often to people who pin the same image. This will help you attract a lot more followers. Sharing a lot of pins should improve your Pinterest presence, which can play a key role in attracting followers. By sharing quality content and images, Daniela of 007 Marketing has amassed thousands of followers for her Pinterest page. If you visit the pins section of the brand page, you’ll notice she shares a lot of helpful pins—and best of all she sticks to the topic of marketing, which should help attract her target audience. You want to show people you know and care about this subject. This can be achieved by leaving a thoughtful comment. This will make people want to check out your page and follow you. Note: Too much commenting is considered spam by Pinterest and can lead to your account being suspended. So limit your comments to two or three times a day. A meaningful comment on a popular pin can also help attract followers. In the above pin, which I found in the popular section of Pinterest, Pam Tufts left a very thoughtful comment. This shows she read the description and has some knowledge of the subject. This should get people who are interested in learning more to check out her profile and follow her. When it comes to Pinterest automation the first tool that strikes in my mind is https://pinpinterest.com/. I have used various tools and websites to automate my Pinterest account, but no marketing tool can compete with the results that I got with PinPinterest. I am getting a lot of traffic on my websites and its increasing day by day. All thanks to PinPinterest.